One of the best methods to use to improve your home is with the addition of a deck. This will not only increase the overall property value, it will help you and your family be able to get more enjoyment from your home. However, in order to have great success with this type of project, it is essential to make it a point to only team up with a reputable expert for the best in quality deck construction. A deck is not traditionally something that you should consider trying to turn into a DIY project. It takes a higher skill level plus you need to be able to be certain that this structure meets code and is safe for anyone using it. Of course, hiring a contractor to address your need for deck construction should only be handled by the very best, which is why locals here know to call on Annapolis Painting Services. Don’t let the name fool you, our painters do plenty more than just great painting work. Our team is as skilled and proficient in deck building as painting work. With over 30 years of industry expertise behind our company name, you can feel confident about the quality of work we will provide you with. Don’t settle for less than the best, when it comes to the final results you will be able to achieve. Want to host a party, cook for the party and still be the life of the party? The best way to accomplish this is by providing a space for having a get together, that doesn’t leave you stuck in the kitchen. Play grill master while still entertaining your attendees and not feeling separated from the action. Your home is your biggest and most important investment. So it only makes sense to want to invest back into it. Adding a quality deck to your home is an ideal way to do this. Plus, you can still enjoy years of enjoyment from it, before ever even considering listing your home for sale. As far as adding outdoor living spaces go, this is often the least expensive method to use. While going all out with an elaborate spread by the pool with a full kitchen and living room type seating area is wonderful, it also may not be financially realistic at the moment. Don’t give up on your dreams of having an outdoor area to make summer memories, when decking will suffice and is just as nice. 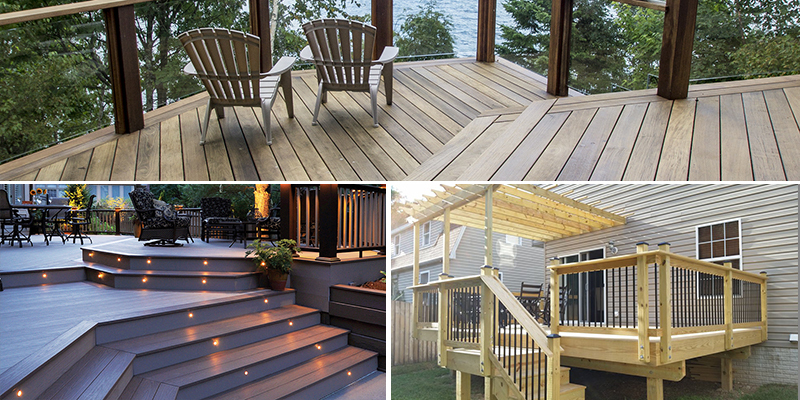 A well designed and executed decking project will enhance the overall aesthetic appeal of your homestead. This will improve curb appeal and take your landscaping design to all new heights. You have plenty of options to choose from, aside from just the basic deck design. You get to pick factors such as wood type, stain or paint color and add ons which all personalize the appearance of your deck. As far as home improvement projects go, adding a deck is also one of the least demanding, when it comes to time requirements. While many tasks for enhancing your house can take a great deal of time, including outdoor living spaces, a deck can be ready for use in a fraction of the time. Once you have decided that adding a deck to your residential dwelling would make perfect sense, all you have to do is call us here at Annapolis Painting Services. Even if you are not yet decided on whether or not this would be right for you, get in touch with us so we can assist you in making a decision. Our job is not just supplying the highest quality workmanship, it is also about vital, personalized customer service. Let us help you make vital choices that will enhance your home, as well as your quality of life. For the best in custom care and final results, let us show you how we have earned the impeccable reputation that we have. If you need to hire a professionally licensed contractor for deck construction services, call Annapolis Painting Services today at 410-974-6768, or fill out our online request form.